Relations with the Grodno Community. Family prominent in the communal life of Grodno and Lithuania during the greater part of the sixteenth century. Judah Bogdanovich, its chief founder, was born about 1475 and died at Grodno about 1546. His father, Bogdan, owned an estate in the district of Grodno prior to the expulsion of the Jews from Lithuania by Alexander Jagellon in 1495. Their departure from the country was followed by the occupation of their real property by their Christian neighbors; and the Bogdan possessions were so appropriated. Judah probably returned to Grodno with the other exiles in 1503. He petitioned for the restoration to him of the estate formerly owned by his father, and his claim was allowed and confirmed by the king. A few years later Judah was engaged in extensive business operations; and he became the farmer of the Grodno wax-taxes (1509). He probably is the "Judah of Grodno" referred to in the list of expenses incurred by the grand duchy of Lithuania for the years 1506-11, as having a claim of 12 kop groschen against the town secretary of Grodno for goods sold to him. His name is again mentioned in a document dated Nov. 11, 1523, wherein King Sigismund Jagellon orders payment to be made to Judah Bogdanovich and Lazar Chatzkovich, Jews of Grodno, for merchandise furnished by them. In 1525 Judah Bogdanovich was collector of taxes, and had extensive dealings with the local nobles, many of them being indebted to him. In 1532, in a royal document issued to Judah, authorizing him to collect a debt, he is styled "merchant to the Queen Bona." At the instance of Prince Andrei Vassilivich Polubenski the fifteen serving-men who had been transferred to Judah in payment of the debt were to be turned over to the prince, the latter undertaking to payto Judah the amount in question. At this time, Judah's oldest son, Abraham (Avraam Igudich), is mentioned in connection with the claim. In the following year King Sigismund confirmed by a decree (June 23, 1533) the findings of the court of rabbis ("doctorov zhidovskikh") held in Lublin, by which Judah's son Pesaḥ was honorably acquitted of the charge made against him by the Jew Yesko Shlomich of Biyelsk to the effect that Pesaḥ had taken from him 13,000 kop groschen which he had failed to return. Some months later Judah and his son Agron (Aaron) were authorized to state under oath their claim against the nobleman Wilenski, who they alleged had borrowed of them 500 gold ducats and 1,009 kop groschen, and Wilenski was then ordered to pay them such claim. Several years later Judah's son Abraham had become a prominent merchant. His name frequently occurs in court documents (1539-41) relating to his attempts to collect debts of money, grain, wax, etc., due to him. 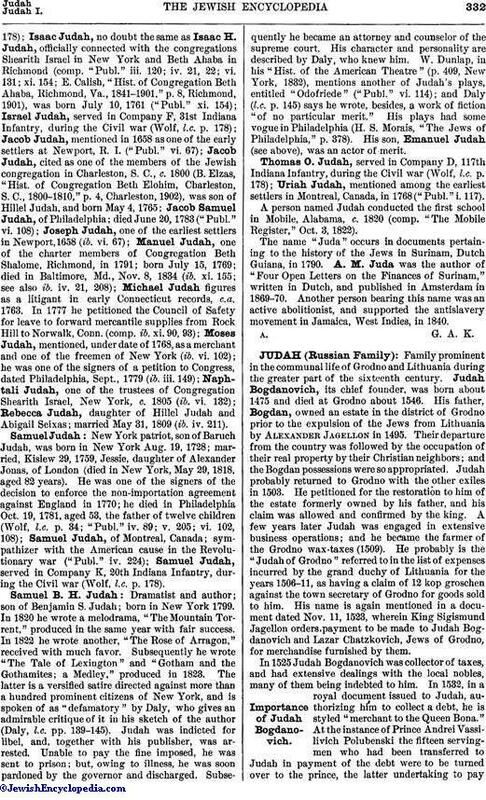 Judah himself is mentioned frequently in legal documents of 1540-41. Thus on April 15, 1540, he was one of the three members of a court of citizens (the other two being Tatars) to pass on the claim of a certain Lukash against the Jewess Brenya; and on June 11, 1540, he was a member of another tribunal which had to consider an agreement made between a Jewess of Grodno, Stekhna Lyatzkova, and her stepson Moses Lyatzkovich. Further evidence of the esteem in which Judah Bogdanovich was held is furnished by a court document, dated Feb. 28, 1541, wherein he is accepted as a reliable witness. On Nov. 8, 1546, Abraham, Agron, and Moshko (Moses), the elder sons of Judah by his first wife, Maryama, came to an agreement with Govash, Ilya, and Shmoilo (Samuel), their brothers by Judah's second wife, Nehama, as to the division of the estate left by their late father. This estate, which was of great value, included gold, silver, houses, lands, and outstanding debts. Breach of the compact on either side was to be subject to a fine of 1,000 kop groschen. Judah had at least three other sons not mentioned in this document, namely, Pesaḥ (mentioned above), Israel, and Bogdan; and to them should be added, perhaps, Naḥman. Moshko Igudich appears as one of the three persons elected (May 22, 1549) by the community of Grodno to settle with the Christian merchants of the city the proportion of taxes to be paid by the Jewish community, and to come to an agreement with them as to other relations of the community with their Christian neighbors. About this time the Judah family antagonized a part of the Grodno community in connection with the appointment of a rabbi. Complaints had evidently been made, since in a document dated Oct. 28, 1549, Queen Bona ordered Kimbar, the magistrate of Grodno, to assemble the Jews of the city for the election of a rabbi who should have no family ties in Grodno. In case of disagreement, the members of the community not related to the Judah family were to be given the privilege of electing a rabbi of their own. The trouble was chiefly due to the determination of the Judah family to place the religious affairs of the community in charge of their relative Mordecai, who had married a daughter of Judah Bogdanovich. The decree of Queen Bona apparently failed to settle the matter; and the leaders of the opposition, Misan Chatzkovich and Isaac Israilovich, made renewed complaints to the queen, who again ordered Misan Chatzkovich and his followers to elect a rabbi of their own, such rabbi to have the same privileges in spiritual matters as the person selected by the Judah family. On July 11, 1559, Moshko Igudich obtained a decree from King Sigismund relieving him from the payment of debts for a period of three years, because of a misfortune that had befallen Moshko's son Isaac, who had been robbed of a great amount of merchandise near the city of Shklov. 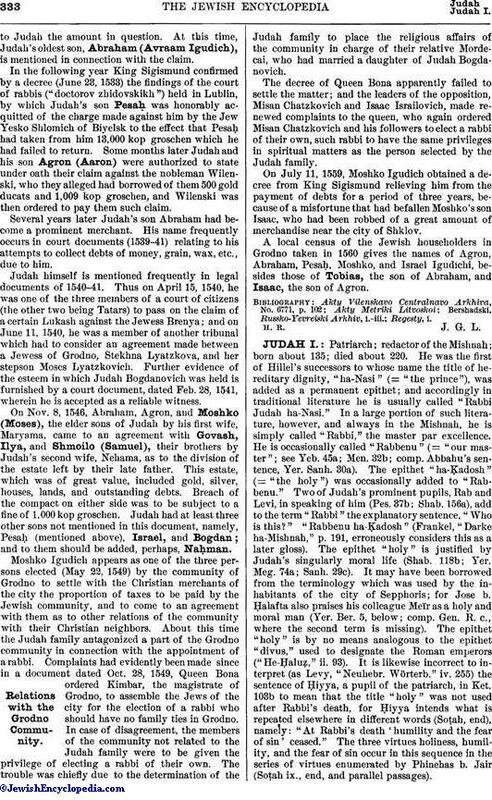 A local census of the Jewish householders in Grodno taken in 1560 gives the names of Agron, Abraham, Pesaḥ, Moshko, and Israel Igudichi, besides those of Tobias, Alexander Jagellon the son of Abraham, and Isaac, the son of Agron.